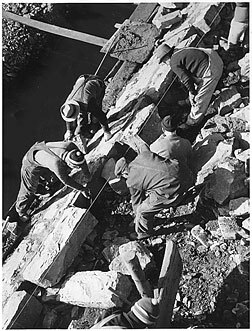 During the Great Depression of the 1930s, putting Americans back to work was a major goal of Franklin D. Roosevelt’s New Deal. Government agencies provided jobs, not only for manual laborers but for artists as well. Eudora Welty’s photographs of Mississippi are one example of New Deal art. 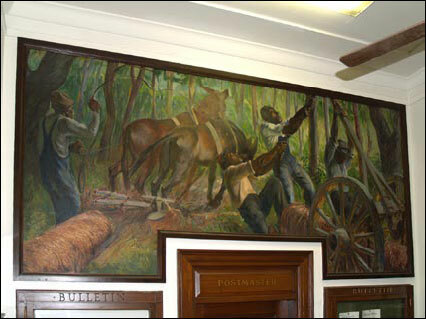 The murals painted on walls of post offices and other public buildings around the state are another. 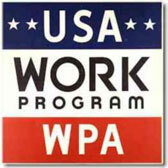 The Works Projects Administration employed millions of people across the United States from 1935 until 1943. Photo courtesy of the Franklin D. Roosevelt Presidential Library and Museum. Julien Binford (right) joined the faculty of Mary Washington College of Fredericksburg, Virginia in 1946, where he served as a professor of painting until his retirement in 1971. Several of his paintings can be seen in the University of Mary Washington Galleries' permanent collection. 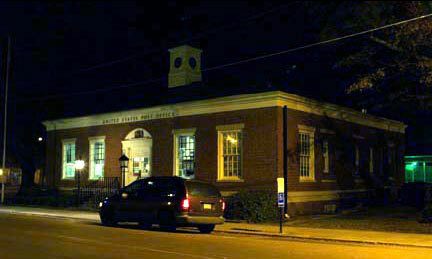 Photo used with permission of University of Mary Washington. At the age of thirty-one, Julien Binford had already established himself as a promising young artist. His abstract and imaginative paintings had been displayed in one-man showings in Paris, and he had similar success when he returned home. Binford and his wife, a French countess, made their new home in Virginia, living in a cabin without electricity or running water. This simple life-style influenced Binford’s painting. His work became more realistic as he relied on his neighbors and their environment for inspiration. oil on canvas mural for the town’s post office (shown below left). The notch in the bottom accomodates a doorway in the wall (see below right). 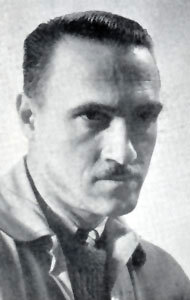 Thirteen months after his first visit to Forest, Binford returned to supervise the hanging of the mural. On May 1, 1941, the Scott County Times devoted only a few more lines to the artist and his work. 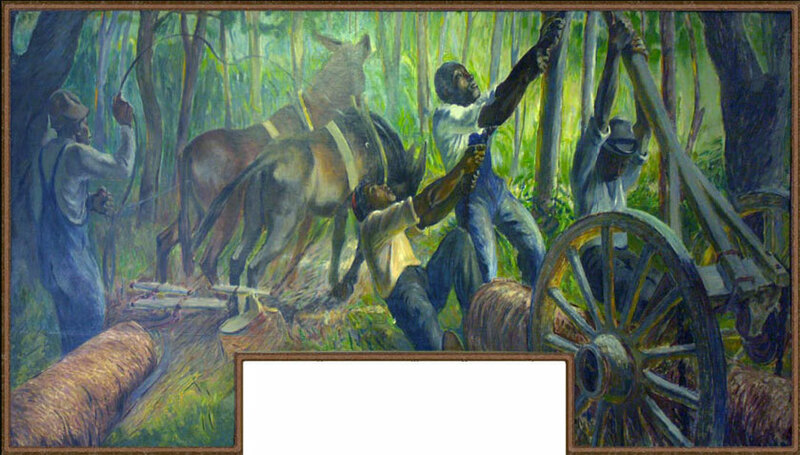 “The woods scene was designed to illustrate both the name of Forest and the lumber industry of the surrounding county.” No mention was made of the black workers in the painting, a subject for which Binford would soon become famous. Given the time, it was inevitable that the subject of race would enter into both the artist’s creation and the viewers’ perceptions of the murals. Binford reported to the Section of Fine Arts that local lumber company officials were pleased with his work. Whatever the citizens of Forest might have thought about their new public art, it received high marks from other sources. When it was displayed temporarily in Charlotte, North Carolina, the Charlotte Observer praised it enthusiastically. 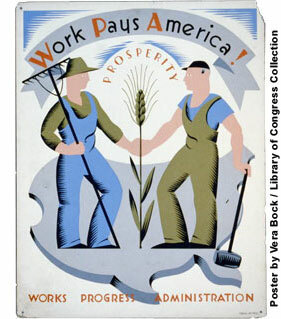 An even warmer endorsement came from an editor of the Progressive Farmer, who called it the best painting he had ever seen in a public building. 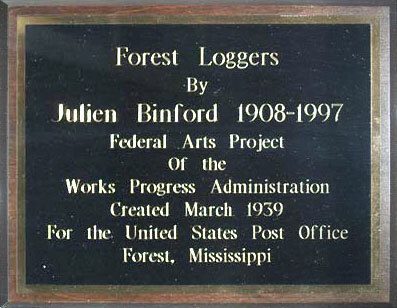 The Forest mural was the only one that Binford did for the Fine Arts Section, but his work received attention in Time, Newsweek, and Life during 1942. The November issue of Life reproduced his most famous mural, a 12 foot x 12 foot painting of the Jordan River done for the Shiloh Baptist Church, a black congregation near his Virginia home. At Binford’s suggestion, the congregation paid him in produce—two pick-up truck loads of chickens, corn, potatoes, and beets [which helped the Binfords tide over the winter]. A realistic style and local subject matter characterized most of the paintings done by Julien Binford and the other Depression-era muralists. Today, after a recent refurbishing, the Forest mural remains an excellent example of both his work and that of the Fine Arts Section artists as a group.